There’s a standard misconception that drug addicts and alcoholics dwell in the lower echelons of society, living in poverty and relying on charity for survival. However, that is often furthest from the truth in many with addiction issues who seem to not only cope, but excel despite being in the grip of alcohol or drug addiction. High-functioning addicts are capable of presenting a very sober face to the outside world, where they are perceived as achievers. This behavior successfully masks addiction issue as it challenges the general stereotype society has conceived for addicts and can also prevent sufferers from considering drug and alcohol rehab. As with all addiction, the sufferer has to accept their need for treatment themselves. Often, a high-functioning addict’s outward behavior also enables them to a certain extent. It’s easier for them to go into denial, thinking that if they have a problem, surely it would impair their performance at work or school? It is precisely this thinking that has the potential to delay a high-functioning addict from seeking help at a drug and alcohol treatment center. They are defensive about their behavior. A high-functioning addict will always have an excuse for a drink. 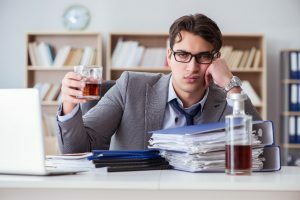 A hard day, a successful day, a rainy day or just another ordinary day can all be used as excuses for drinking at work or school and if that fails to appease others, they often claim they deserve a reward for their career success. In this way, a blanket of denial is thrown over their own addiction issues although ironically, it is behavior that typifies the illness for onlookers. They drink or take drugs to excess. In some jobs, it is easier than others to drink in work settings without necessarily behaving any differently than is considered acceptable. However, a high-achieving addict will always go a step further than others with another drink, leading to another and so on and usually, while inciting others to join in. In many senses an addict feels more able to indulge in substance abuse when others are participating as it enables them further, making drug and alcohol rehab less likely to happen. They surround themselves with other addicts: Just as misery loves company, so does addiction and often a high-functioning addict will have friends who are using too. This provides the perfect environment for addiction to thrive. However, while forming new friendships with other users addicts tend to force out existing relationships that don’t endorse their negative behavior. This is a common sign of a high-functioning addict. They appear to look unwell in the mornings. Although a high-functioning addict is able to perform and possibly excel at school or work, it is harder for them to hide the physical consequences of drinking too much or using recreational drugs. If their appearance is commented on by others, a functioning addict is more likely to chalk it up to stress, lack of sleep or just not being a morning person whereas the truth is they are likely to be suffering from a hangover or withdrawal symptoms. They lose interest in leisure activities. Where a high-functioning addict may have participated in a wide range of activities before addiction, they can become disinterested in these pursuits in favor of using. Getting high becomes the central focus of an addict’s life and it is when their previous passions are replaced with withdrawn behavior and isolation that addiction is clearly present. It is very clearly possible for a functioning addict to mask their issues with behavior that belies them. Because one of the first steps in getting better is to accept there’s a problem, it is often harder for someone who appears to be completely on top of things in their lives to make themselves vulnerable enough to seek treatment. In these cases, it is often the intervention of colleagues, coworkers, family, and friends that serve to highlight underlying addiction issues that the sufferer may not otherwise be in a position to accept. Communication, group therapy, and counseling go a long way to helping achievers who are addicted take full responsibility for their issues and accept they have a need for addiction treatment.